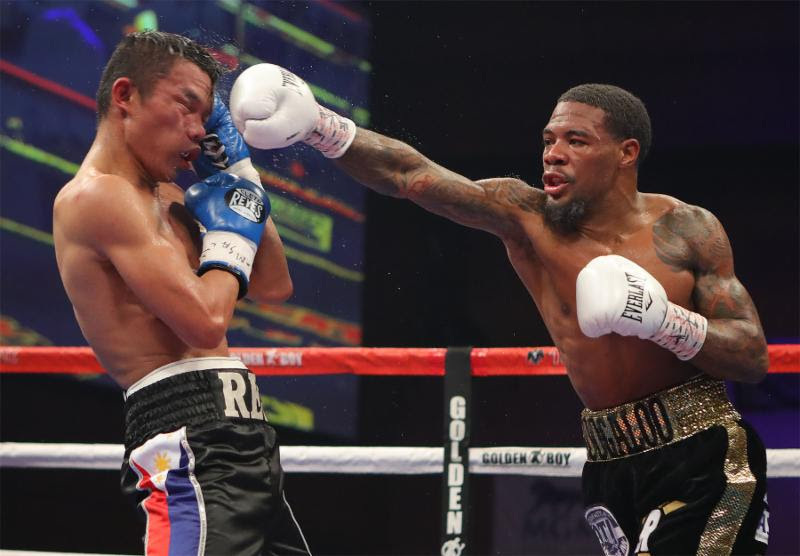 Super Featherweight Prospect Lamont Roach, Jr. (16-0, 6 KOs) demonstrated yet again why he’s one of the best and brightest prospects of the Golden Boy Promotions stable as he defeated tough contender Rey “Flash” Perez (21-9, 6 KOs) via unanimous decision in the 10-round main event of the latest edition of Golden Boy Boxing on ESPN at the MGM National Harbor in Maryland. Despite getting caught with a hard shot to the body in the second round, Roach, Jr. prevailed in exciting and dominant fashion, landing right hands and lead left uppercuts to hurt Perez in the later rounds. Roach, Jr. won with three scores of 99-91. Avery “A Plus” Sparrow (9-1, 3 KOs), the super featherweight prospect of Philadelphia, Pennsylvania, scored a dominant unanimous decision victory against Carolina, Puerto Rico’s Jose “Wonder Boy” Lopez (18-2-1, 13 KOs) over ten-rounds of action in tonight’s co-main event. Sparrow was cautious in the opening rounds as Lopez pushed forward, but as the round progressed, Sparrow began to display both his ring experience and the ring IQ he has inherited from the Philadelphia school of boxing. Sparrow won with scores of 96-94, 96-94 and 97-93. Fairfield, California’s Manuel “Tino” Avila (23-1, 8 KOs) scored a tough unanimous decision win against Diuhl Olguin (11-9-2, 9 KOs) of Guadalajara, Mexico. Though Avila hurt his left hand during the latter part of the fight, he remained victorious with scores of 77-75, 78-74 and 78-74. Lamont Capers (8-10-3) defeated Luther Smith, Jr (9-2, 8 KOs) via four-round split decision in a cruiserweight fight. Smith scored a knockdown in the first round that nearly sent Capers out of the ring, but was unable to finish Capers. One judge scored the fight 38-37 for Smith, which was overruled by two scores of 38-37 for Capers. Thomas Williams (0-0-2) of Lynchburg, Virginia and Alberto Delgado (0-2-3) of Roanoke, Virginia fought to a four-round majority draw in the super middleweight division. One judge scored the fight 39-37 for Delgado, while two others had it a 37-37 draw. George Rincon (3-0, 1 KO) of Carrollton, Texas scored a fourth-round TKO victory against Seifullah Jihad-Wise (3-4, 1 KO) in super lightweight division. After Rincon punished Jihad-Wise for three rounds, the fight was stopped officially at the very first second of the fourth round. Roach, Jr. vs. Perez was a 10-round lightweight fight presented by Golden Boy Promotions. The event was sponsored by Tecate, “THE OFFICIAL BEER OF BOXING” and Hennessy “Never Stop, Never Settle.” The event took place on Nov. 30, 2017 at the MGM National Harbor in Maryland.